The Boston Celtics lose a close one to the Cleveland Cavaliers, 102-99, but more importantly they lost one of their new stars, Gordon Hayward, to a horrific left ankle injury early in the game. Jaylen Brown had himself a night scoring a career-high 25 points and 6 rebounds. Kyrie Irving had a solid debut against his old team with 22 points and 10 assists while Jayson Tatum had a tremendous rookie debut as well with 14 points and 10 rebounds on 5 of 11 shooting in 36 minutes. LeBron James led the Cavs and looked to be in MVP form already tallying 29 points, 16 rebounds, and 9 assists, looking unstoppable per usual. Kevin Love chipped in 15 points and 11 rebounds while Derrick Rose and Dwyane Wade both had less-than-stellar debuts in Cleveland. After a Cleveland timeout, Brown scored again from inside and then it happened - Gordon Hayward came down awkwardly on his left leg under the basket. ***If you really want to see it, here's the link. Be forewarned if you haven't, it's brutal. Hayward clearly snapped his right ankle, sucking the air out of the entire Quicken Loans Arena. 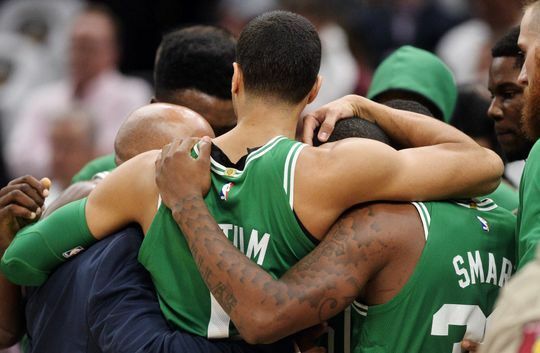 The Celtics players new immediately what had happened, huddling up to try and compose themselves as their teammate was tended to by the medical staffs of both teams. One of the Celtics new stars season likely coming to end just as it began. The Cleveland fans gave a standing ovation as Hayward was taken off the court. The players from both teams were shook up as a distraught Hayward was carried off the floor, and yet the game had to continue. The C's looked lost for the rest of the 1st (understandable) as they labored through the final 6:45 of the quarter. The Cavs rattled off a 12-2 run to take a 10 point lead into the 2nd, 29-19. Celtics bench understandably solemn right now. Normally they'd be going nuts after that Baynes block. No one moved. Baynes was one of the few Celtics who looked impressive in the 1st half, scoring both of his attempts from the field and looking like a real presence on the defensive end. Brown led the C's in scoring with 12 points on 5 of 11 from the field to go along with 4 rebounds, while Irving notched 9 points on 4 of 9 with 5 assists and a pair of steals. LeBron was outstanding, finishing the 1st half in triple double territory with 14 points, 7 rebounds, and 6 assists shooting 75% from the floor (6 of 8). Jae Crowder settled into the Cavs starting lineup quickly with 11 first half points helping his new team to a 16-point lead at the break, 54-38. The Cavs answered back with a 7-1 run to squash that energy rather quickly, but the Celtics weren't ready to fold up shop just yet. They rattled off 9 straight points of their own, cutting the Cleveland lead to single digits for the 1st time since the 1st quarter (61-52, Cavs). Marcus Smart and Tatum shook off their shooting woes in the first half, scoring 21 points between them in the 3rd quarter and rallying the Celtics all the way back to a two-point lead before a Rose heave put the Cavs ahead by 1 heading into the final frame. The Celtics went to Smart in the post again and again, as he abused Kyle Korver on the block. The 4th quarter started with a flurry of action. Irving re-entered the game with 10:32 to go and proceeded to bury three straight threes that helped the C's to stay out front midway through the quarter. The Celtics young bucks looked poised and confident throughout the 4th, matching the Cavs shot for shot until a 7-0 run late put Cleveland back out front. The Celtics got two good looks from three to tie the game, including a three from Irving as time expired that looked like it could go in but ultimately came up short, sealing the win for Cleveland. It was tough to watch this game after the horrendous injury to Hayward, but somehow this Celtics team made it fun again. While they might not be as good without Gordon on the floor, they're going to be a fun team to to root for. They have a ton of heart. Our thoughts here at CelticsLife are with Hayward now. We'll do our best to keep you posted on him and his injury going forward. All the best Gordon.